From rudimentary folk beginnings, string instruments of India have now reached the heights of concert glory, giving endless moments of ecstasy and delight to listeners. The strumming of a series of taut metallic strings is capable of creating an enthralling experience of vitality and emotion. As the player slides over the notes, the listener experiences moments of pure bliss. There is an entire tradition in Indian music where musical instruments of the stringed variety form a separate classification, termed as ‘Tata Vadya‘ or the sound of the strings. These instruments are also termed as chordophonic, which means string sounds. In the western world the Sitar is perhaps the most well known musical instrument of India. The Sitar is a plucked string instrument that uses sympathetic strings and a long hollow neck along with a gourd resonating chamber in order to produce a very rich musical sound along with a complex harmonic resonance. The Sitar is predominantly used in Hindustani classical music. This instrument is one that has been used all throughout the Indian sub continent, particularly in Bangladesh, India and Pakistan. What’s not known is its exact origin. The Sitar has been in existence for thousands of years in one form or another, but there are several theories as to who invented it. There is a common story attributing the invention of the Sitar to Amir Khusrau. Amir Khusrau was a great personality and is an icon for the early development of Hindustani classical music. He lived around 1300 AD. As common as this story is, it has no basis in historical fact. The Sitar was clearly nonexistent until the time of the collapse of the Mughal Empire. Most people agree that the modern Sitar first appeared in the 1700s at the end of the Mughal Empire. Legendary musicians associated with the Sitar include Vilayat Khan, one of the most prominent Sitar players of the 20th century, and of course Ravi Shankar, who brought the Sitar to Woodstock. you must be really nice person and wish you all the luck, THANKS. Raga Bairagi at a Paharganj shop is out of this world! The serene beauty of the melodious notes takes one away with it to another world, a world of fancies and dreams, a world of sublimity and supreme tranquility of the state of pure ‘Beingness’! It is a pity that we do not know the name of this blessed player! May God shower all His kindness and love on this otherworldly musician. But the instrument that is being played sounds more like a Surbahaar and not much like a Sitar.Anyway the sound is divine. You deserve all music-lover’s praise and congratulations for having captured and uploaded this superb piece of music on your site. 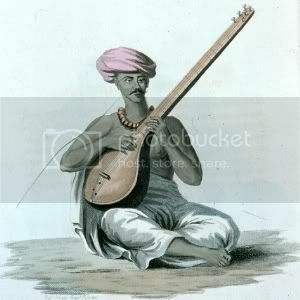 The Raga Bairagi piece was played on SAS (semi-acoustic sitar). The player is one Swedish / German musician, Mr. Hasse. This semi-acoustic sitar (sas) is indeed wonderfull! What deep tonal quality! It comes close to the gravity of the sound of Veenaa.It is great! I’m totally new to any form of classical music. Raag Bageshree sounds the most sweet one to me. Also compared to other instruments Sitar, Veena and Flute seems to strike a chord immediately. This site is really good!